Jeffrey Muehleisen is the project facilitator for the Curriculum Professional Development Center of the Clark County School District. The center focuses on curriculum writing for the district, (math, science, history, music, art, band and orchestra), establishing text books, workshops, staff and services, and webinars. In his role, Mr. Muehliesen is responsible for monitoring elementary physical education, collaborating with curriculum developers for kindergarten through twelfth-grade students, setting up workshops, conducting conferences, and monitoring grants. Mr. Muehleisen is also in charge of overseeing the annual staff development conference in conjunction with the state conference for elementary and secondary school professionals. 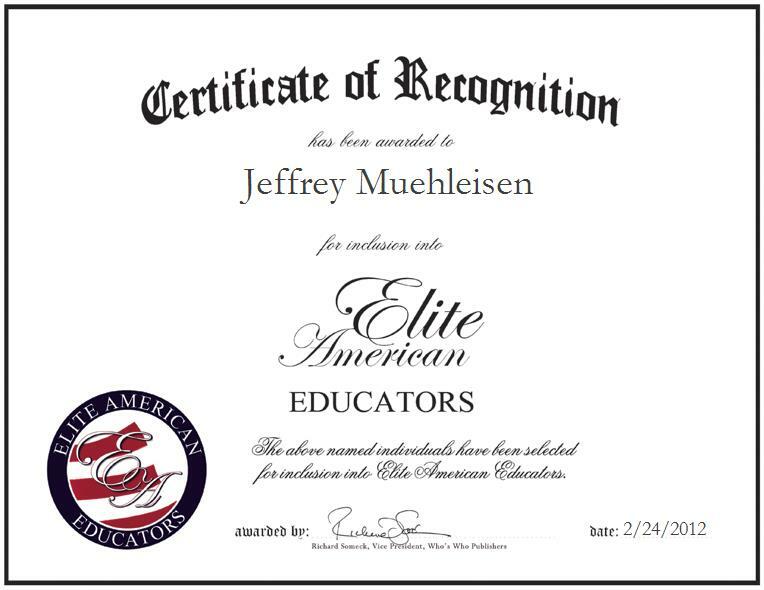 For his outstanding efforts, Mr. Muehleisen was nominated to serve as a representative of sports for the Southwest District, and as a delegate for the Associate Delegate Assembly for the American Alliance for Health, Physical Education, Recreation and Dance.